Pic shows: Tiger in the cage. A Chinese man that ate tiger penises after hiring poachers to kill the big cats before giving the rest of the meat to businessman pals has been jailed for 13 years. Wealthy businessman Xi Pai had reportedly created a network of illegal poachers operating in south Chinas Guangdong province where they tracked the tigers alive, and then illegally transported them to the businessman where he used his network to bring them home. He also hired a butcher to cut up the animals and the court heard that he had insisted on being caught alive so that when they were killed, they could be bled and he was able to drink the blood. Prosecutors said that apart from the blood in the penises, the rest of the meat from the tiger had been sliced off and handed out as gifts to gourmet friends and very occasionally pieces were also sometimes sold. When police raided the man’s home they found meat in a fridge which was confirmed to have come not only from tigers but also from other exotic species including geckos and cobras. They also arrested 14 other people who were also jailed for their role in the illegal poaching operation that prosecutors claim resulted in at least 10 tigers being killed and eaten. The businessman himself had notched his way through at least three tiger penises, and drug several litres of tiger blood according to the evidence. They said that the tigers had been killed by electrocution so that the hide could be removed and also used to create trophies that were similarly handed out to pals. As well as the 13 year sentence, Xu was also fined 160,300 GBP by the court in south central Chinas Guangxi Zhuang Autonomous Region. The 14 others were given varying lengthy sentences depending on their involvement in the tiger eating scandal. 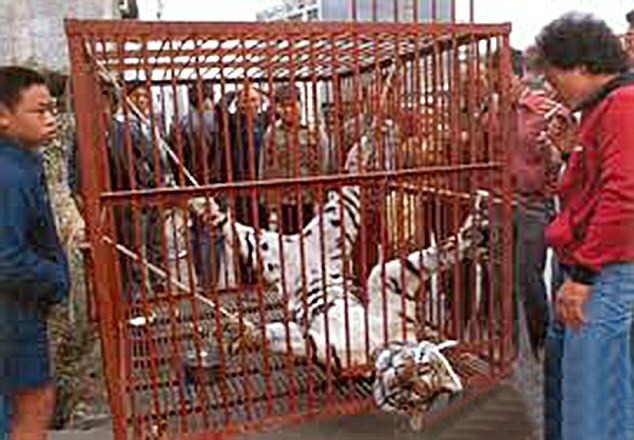 Tiger meat is not only sought after on the black market but is often used in Chinese medicine. The previous habitual killing of tigers had landed it on the top of the worlds endangered species list and it is one of the most highly protected animals in China.